Inside-out is a group exhibition featuring Southern California artists whose practices blur the line between interior and exterior orientation. Working with both painterly surfaces and spatial installations, Lorenzo Hurtado Segovia and Max King Cap use layering processes to construct spaces and forms. Hurtado Segovia methodically weaves hundreds of painted and sliced strips to assemble double sided paper works. Hung off the wall with irregular edges, Hurtado Segovia’s pieces seem to playfully expand and contract while inviting viewers to gaze upon and walk around these intricate surfaces. Cap’s floor and wall pieces utilize structures and patterns from cathedral architecture, formal gardens and star charts. By integrating distant and intangible constellations with grand, ornate architecture and landscape, Cap produces multilayered picture planes on paper and canvas. The paintings on paper and canvas by Chet Glaze and Misato Suzuki use popular imagery as a vehicle to merge personal intimacies with external stimuli. 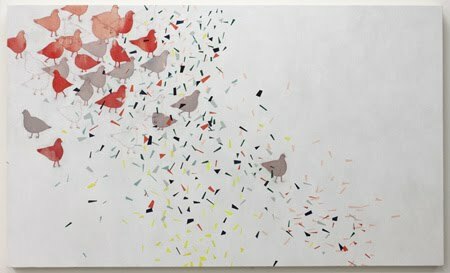 In Suzuki’s paintings, flocks of pigeons wander through abstract spaces like pedestrians in urban centers. 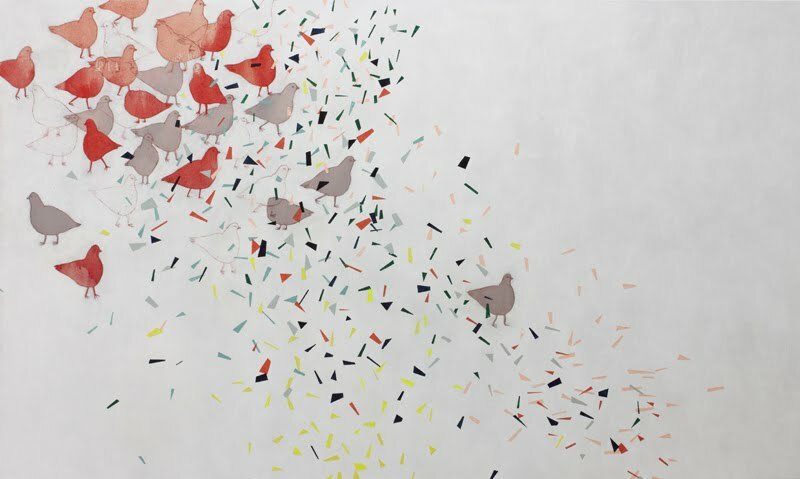 Environmental forces of confetti-like patterns and translucent color fields direct the flow of these fowl and replace individuality with nomadic unity. 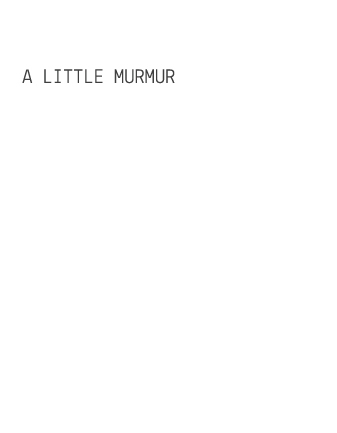 Glaze uses imagery from television stills, which seem to fill gaps in experiences and memories. With a focus on the passing of time, the spaces in his paintings present unfolding circumstances and embrace moments of suspended disbelief. Max King Cap has been in numerous solo and group exhibitions in various media and genre; he has exhibited in Chicago, IL; Los Angeles, CA and New York, NY. | Chet Glaze, a faculty member at Chaffey College and Mt. San Jacinto College, has exhibited in Berlin, Germany; New York, NY and Santa Monica, CA. | Lorenzo Hurtado Segoviais represented by CB1 Gallery Los Angeles, CA and has exhibited in southern California and El Paso, Texas. 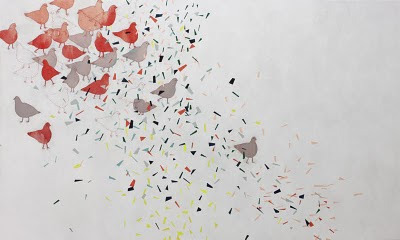 | Misato Suzuki is represented by Sam Lee Gallery Los Angeles, CA and has exhibited in Tokyo, Japan; Victoria, Australia; Seattle, Washington and Los Angeles, CA. For additional exhibition information please contact Dion Johnson djohnson@laverne.edu or 909.593.3511 x 4273.